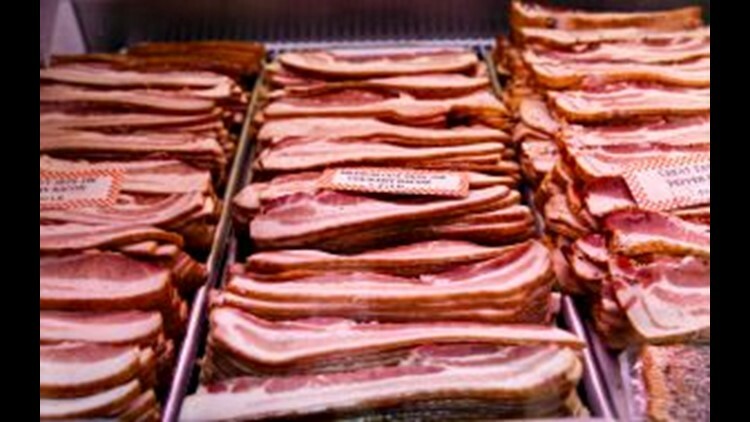 Sliced bacon is displayed for sale at a market in Washington, Thursday, April 24, 2014. North Carolina, the second-largest hog producer in the U.S., is in the path of Hurricane Florence. But whether the belly of the pork industry will be hit hard enough to impact prices for shoppers at supermarkets around the country remains to be seen. There's concern that extreme weather could kill enough animals to impact supply. However, if the hogs remain unharmed – in some cases, farmers have relocated them – the issue then becomes how soon after the hurricane the area's slaughterhouses can reopen. Otherwise, the animals can get too big and produce too much meat. The total U.S. inventory of hogs and pigs was 73.5 million, according to the U.S. Department of Agriculture's quarterly report, released June 28. North Carolina was home to 8.9 million – or 12 percent – of those. The difference between pigs and hogs? Pigs generally weigh less than 200 pounds, while hogs are 200-plus pounds. Phil Flynn, senior market analyst at the Price Futures Group in Chicago, is bullish on hogs and anticipates as much as a 30-cent-per-pound hike at grocery stores. "It could be big bucks," he said. "What makes this even more potentially devastating is we could wipe out millions of hogs." Americans do love their pork. U.S. shoppers spent $6.24 billion on fresh pork in the 52 weeks ending Aug. 25, according to the consumer data company Nielsen. That's up 0.9 percent compared to the same period a year earlier. Christine McCracken, senior protein analyst for Rabobank, isn't buying that pork prices will go up at food stores. She sees the issue as the logistics of getting the hogs to the processing plants due to freight routes downed by Hurricane Florence. "Meat companies will struggle. They will have lower sales for some period of time," she said. McCracken added that there are large inventories of pork across the country to cover some of the shortfalls. In the path of the hurricane sit five hog processing plants that will remain offline for several days, though if too many days go by, they may have to stay open beyond their regular Monday-through-Friday schedules to catch up afterward. "As long as they come back up on Sunday and are minimally affected, it won't be a problem," she said. "(The hogs) will gain a little bit more weight. Prices will come down a bit because there'll be too many pigs and not enough places to slaughter them. They’ll have to run on Saturdays." Among the slaughterhouses closing is Smithfield Foods' Tar Heel, North Carolina, facility, which is the largest hog processing site on Earth. According to the company, the facility has 4,440 employees and can handle as many as 35,000 hogs daily. It's also shuttering its Clinton, North Carolina, facility, which has a 10,600-head-per-day capacity.